Seems like every year there's that one indie (and I'm using the term loosely here) comedy that pitches itself so perfectly down the middle of the road that it becomes a crossover hit. 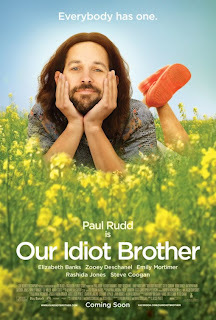 OUR IDIOT BROTHER aims to be this year's model. It tries its hardest to follow the same quirky/cute formula (with just a hint of edginess) as LITTLE MISS SUNSHINE, JUNEBUG, and THE KIDS ARE ALRIGHT. Personally I think these kind of movies have only slightly more indie cred than a Kristen Bell rom-com or TRANSFORMERS sequel, but I'll admit to enjoying some of them (although it should be noted that I loathe LITTLE MISS SUNSHINE). But I digress.On to the film at hand. The idiot brother of the film's title is neo-hippie Ned (Paul Rudd). He may not be the sharpest knife in the drawer, but he's a kind and accepting person, almost pathologically honest, who assumes people always have the best intentions. For instance, when a police officer stops by Ned's organic produce stand and asks him for some pot to help deal with a rough patch in life, he takes the cop at his word and tries to help out. He's genuinely surprised when he gets arrested. Ned spends some time in jail, but is such a cooperative prisoner that he gets released early. Upon returning home, he soon discovers that his problems aren't over: His (now ex) girlfriend Janet (Kathryn Hahn) has left him for new stoner boyfriend, Billy (T.J. Miller). But that doesn't hurt nearly as bad as the fact that Janet refuses to let Ned have custody of their dog, Willie Nelson. Now homeless, Ned winds up crashing with his sister Liz (Emily Mortimer) after she foolishly tells her ne'er do well sibling that her door is always open. But Ned's honesty, as well as his encouragement of nephew River (Matthew Mindler)'s interest in martial arts (something Liz and her filmmaker husband Dylan (Steve Coogan) have forbidden) soon gets him in trouble. Ned then moves on to his other two sisters – lesbian performance artist Natalie (Zooey Deschanel) and magazine writer Miranda (Elizabeth Banks) – with predictable results. Ned is a character in the Hollywood tradition of magical morons ala Forrest Gump. His sisters blame him for “ruining their lives”, but of course it's their own dishonesty, not just with others but with themselves, that's really to blame. Maybe if they were a little more like Ned, they'd all be happier. Bleah. That Ned comes across on screen with any kind of nuance or believability at all is a testament to Paul Rudd's abilities as a comedic actor. Ned's sisters are written as even more cliché ridden and cardboard, so there's not a lot the actresses can do with them no matter how hard they try. The whole affair is rather bland and has little to offer that feels fresh or real. But there is that performance by Rudd, and more importantly, there are some laughs. It's not enough to make me recommend it, but at least I didn't hate it as much as LITTLE MISS SUNSHINE. 2 1/2 out of 4 stars.